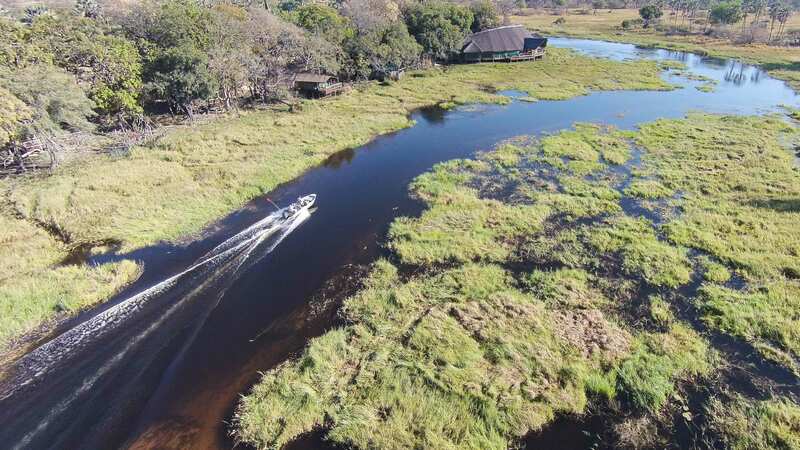 Located near the most southern part of the famous Chief’s Island, Moremi Crossing is situated on a small palm fringed island called Ntswi which is surrounded by the Moremi’s game-rich seasonal floodplains. 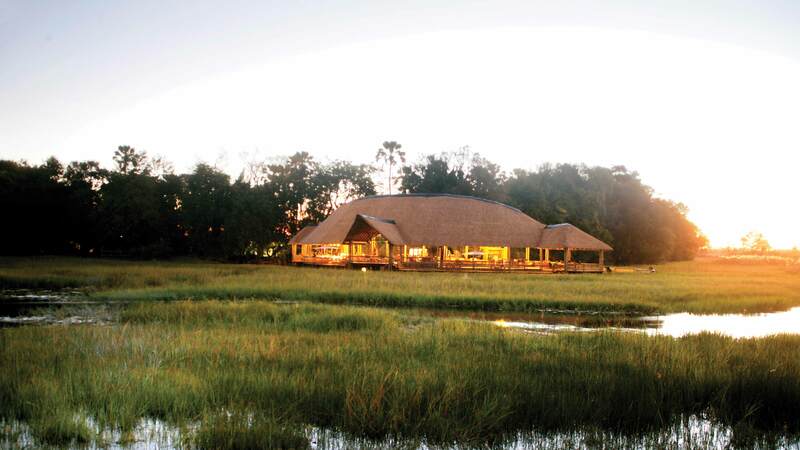 In contrast to the northern Okavango Delta, where the waters are fast-flowing and the channels and view is enclosed by high reeds and papyrus, the channels around Moremi Crossing and its sister camp Gunn’s Camp offer far reaching vistas of the Moremi’s floodplain. 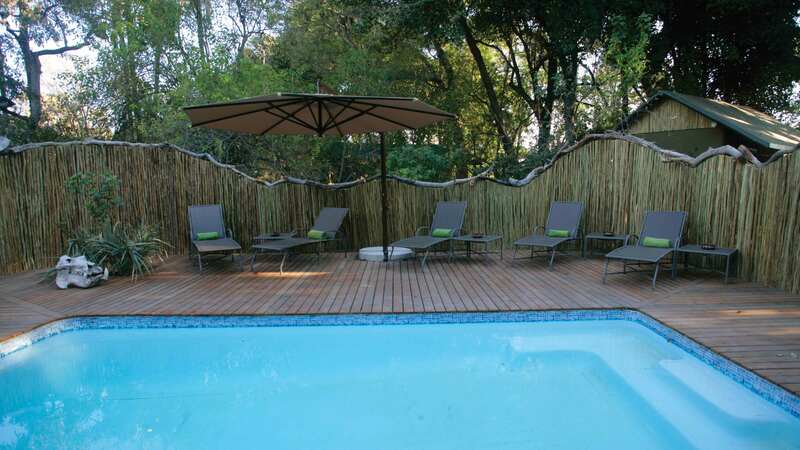 Guest can enjoy unparalleled views of grasslands and marginal woodlands interspersed with Mokolwane palm islands. As you fly over the Delta you can see the intricate twisting and turning of the waterways and the ever-changing colours where dry land meets Delta. Accommodation consists of 16 en suite and spacious tents each with its own private wooden deck offers magical views over the Boro River onto Chief’s Island. Tents have their own eco-friendly outdoor shower heated by solar power. All meru tents are large and airy with en suite bathrooms consisting of a shower and toilet. They have both a Family Tent sleeping four (2 adults and 2 children) and a Honeymoon Tent with an outdoor bath. Enjoy the indigenous and rich flavours of Africa in the dining room. The dining room, bar and lounge are covered by a large thatched roof that hugs the tree line. Various small private lounge areas have been created for comfort, privacy and spaciousness. Enjoy three cooked meals including a high-tea. Time slows down at Moremi Crossing as guests have the chance to experience the Okavango Delta and its game from a very different slower and closer perspective: whilst on foot or silently being poled by mokoro through the Delta’s waterways whilst in search of game. Through the provision of high quality guiding services and new custom made boats Moremi Crossing offers a more personalized wildlife experience. Activities on offer are half or full day mokoro trips with game walks, bush walks with picnic lunch, wilderness camping and sunset motorboat cruises. If you want distractions from technology and experience the Okavango Delta without frills, then this is true paradise!